SAWA Framework is the perfect tool for automatic or manual trading ! 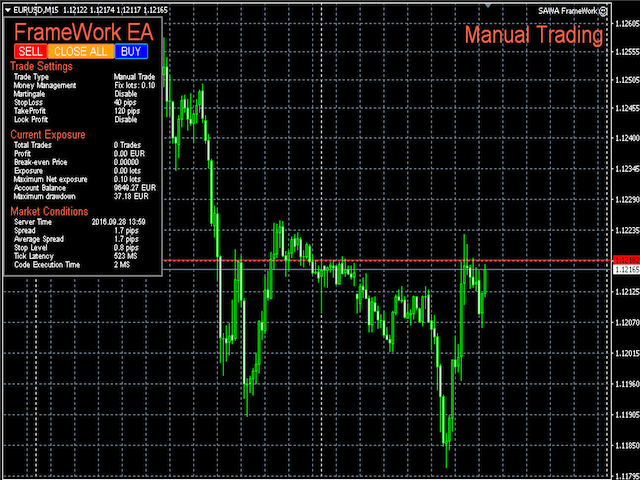 You can trade manually or use it in automatic mode with your own strategy. The expert advisor opens a position when all signals enabled agree on the direction of the trend. Auto-lot calculated with a percentage of the account Balance in risk. Auto-lot calculated with a multiplier of the previous position. Enable adding in opposite directions in a range. Bill Williams indicators (With signals according with some of the B.W. Dimensions). Stop-loss / Distance to average (add against) / Tunnel Martingale Range. Take-Profit / Distance to average (add in profit). Average Spread of the last 100 ticks. Stop Level: minimum distance to set the Stop-Loss/Take-Profit. Tick Latency: Time in MS from the last Tick of the price. Code Execution time: Time in MS that takes to the computer to read and execute the actions of the expert’s code. A good performance would be a value under 20 MS.
Total Trades: Number of orders open by the EA ( Magic Number ). Profit: of the current trades in account currency. Exposure: ( Long Lots – Short Lots ) . Max Net Exposure: Absolute value of the maximum exposure according with the Money Management and Martingale settings. Maximum drawdown: maximum loss according to the maximum net exposure and stop-loss. In live trading you have to count the margin requirements that are not included in the Maximum drawdownin order to control your free margin. Trade Type: Auto Trade / Manual trade ( with trade panel ). Allow Buy / Sell: for Auto Trade mode. Close Positions Without Open More. Max Trades: if martingale is enable. Risk Per cent: for Risk Per cent MM. Profit Per cent to close all. Lot Size: for Fix lot MM. Lot Multiplier: if martingale is enable. Lock Profit: Disable / Trailing stop / Break even. Trailing Stop / Break-even Distance (in pips). ATR Multiplier (only available if martingale is disable). Use Indicator: Enable or Disable the indicator signal. Indicator Shift: Shift = 0 will generate the signal in real time ticks. Shift = 1 will generate the signal at the open of the next candle. Great work, I had been looking for something like this for some time. I can't wait to get it working. Question 4 you Alejandro, do you sell the HF scalper? My sincere congratulations, the expert advisor works excellently, has many options, with high level indicators to combine with various strategies and is very well designed. Keep up the good work my friend. Changed: The expert can open more thna one trade at once. Fixed: Stops for martinale disabled are set correctly. 1.2. Tunnel martingale now draws an horizontal green line at the Break even price. 2. Magic Number is now 9876. WARNING: To be able to update the EA I had to enable a trading signal in the preset to make it trade in the automatic tests. The ADX signal is ENABLED on the PRESET!